Controlling a computer remotely may require some complex configurations and a lot of running around, from one machine to another, depending on what application you are using. 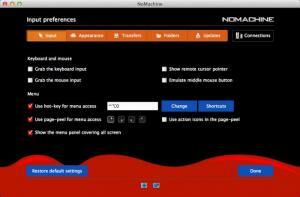 If you want everything to be straightforward and easy, then NoMachine is one of the best choices you can make. It is capable of establishing a connection to a remote computer in a matter of seconds, without requiring too much user input. The application comes with many other useful features as well, including access to USB devices, printers and other equipment, screen recording and much more. NoMachine doesn't come in client and server modules, so you can run the same installation file on both ends. Its user interface has a modern design and a clean layout. The connection profiles you save will show up on this interface and you can double click them to connect to their corresponding computers immediately. Creating a new profile requires the remote host's name or IP address and you can also make some choices, like what type of protocol to use, to use a proxy or not and others. Besides saving and running profiles, you can also connect to a remote host by simply typing its IP address or name in an input field, on the main interface and clicking a button. Once you establish a connection, the application will save it as a new profile automatically. When connected to a remote host, you may control it as if you were right in front of it. Furthermore, you can set the application to capture your keyboard input on the remote computer, to show its mouse cursor, to record the screen and much more. The best part is that the image quality of the remote desktop is quite high, without any noticeable impact on performance or on the connection's speed. NoMachine is capable of establishing a connection between two computers in just a few seconds. It allows you to create connection profiles and it saves your quick connections automatically. Also, the application offers a useful set of miscellaneous tools. There are no obvious design flaws or functionality gaps to address. NoMachine's straightforward design and easy to understand functionality allows anyone to control a computer remotely, including novice users.